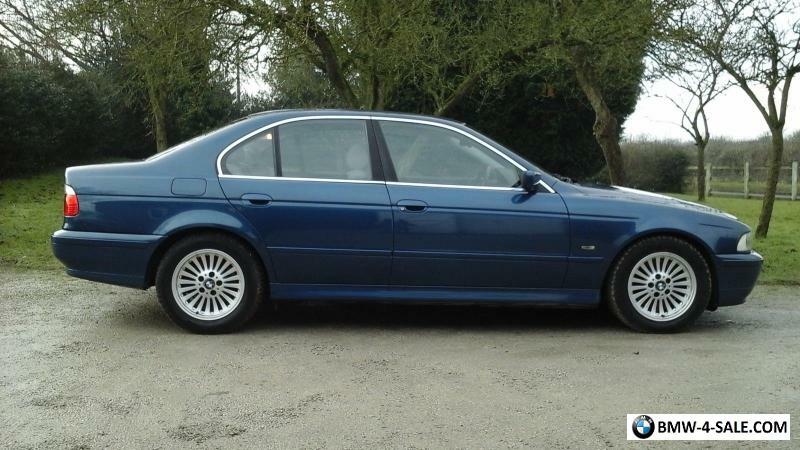 BMW 530D SE DIESEL SALOON 2001 Y124000 MILESLUXURY CYLINDER DIESEL AUTOMATICLOTS OF CAR FOR THE MONEY!!! 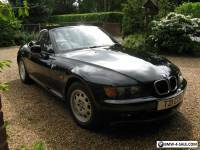 SOME SERVICE HISTORYMOT UNTIL 17TH JUNE 2017DRIVES SUPERB! POWER STEERINGELECTRIC WINDOWS AND MIRRORSCLIMATE CONTROL WITH AIR CONDITIONINGCD RADIOFULL LEATHER INTERIORAUTO WIPERSALLOY WHEELSFRONT FOG LIGHTSANGEL EFFECT FRONT SIDE LIGHTS!! 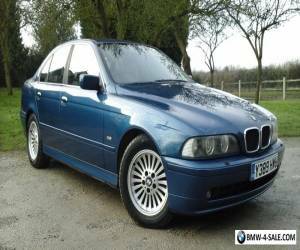 ATTRACTIVE CAR IN METALLIC BLUE, JUST TAKEN THIS IN PART EXCHANGE AGAINST NEWER CAR, PREVIOUS OWNER NEEDED TO DOWNSIZE TO SMALLER CAR. LOTS OF CAR FOR THE MONEY! IF YOU ARE LOOKING FOR LUXURY AUTOMATIC ON BUDGET THEN THIS IS FOR YOU! MECHANICALY VERY GOOD. SOME SERVICE HISTORY WITH STAMPS IN THE SERVICE BOOK AND VARIOUS RECIEPTS. EGR VALVE WAS REPLACED LAST MONTH AT COST OF £339. 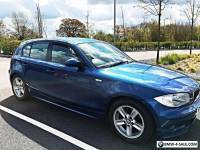 DRIVES SUPERB VERY SMOOTH CYLINDER DIESEL AUTOMATIC AN ABSOLUTE PLEASURE TO DRIVE! THERE ARE NO WARNING LIGHTS AND NO OVERHEATING ISSUES. READY TO DRIVE AWAY! THE PAINTWORK IS STARTING TO LOOK LITTLE TIRED IN PLACES. THE LAQUER HAS STARTED TO LIFT ON THE BONNET AND THE PASSENGER SIDE FRONT CORNER OF THE ROOF(SEE PHOTOS) THE REST OF THE CAR IS VERY CLEAN AND TIDY FOR THE AGE AND MILEAGE AND POLISHES UP VERY WELL. 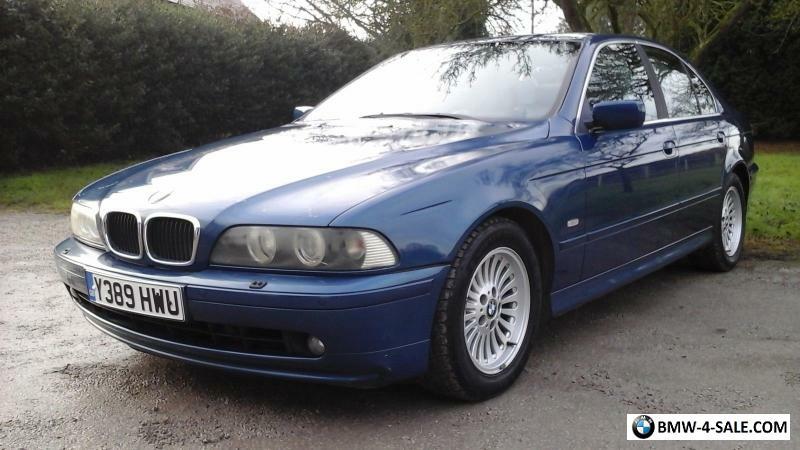 HAVE BEEN TOLD THAT THE BONNET AND ROOF NEEDS RE LAQUER ONLY IF THIS BOTHERS YOU!? OVERALL ITS VERY GOOD LOOKING CAR!! INSIDE IS VERY NICE! THE LEATHER SEATS ARE VIRTUALY IMMACULATE. THERE ARE NO SMELLS OR UNTOWARD ODOURS. THERE IS SMALL CRACK IN THE WINDSCREEN WHICH HAVE TRIED TO PHOTO! ITS NOT BAD BUT THE SCREEN WILL EVENTUALLY NEED REPLACING(NORMALLY FREE IF YOU PUT IT THROUGH THE INSURANCE) IF IM BEING PICKY THERE IS BROKEN TRIM BY THE DRIVERS SEAT BUT DOESNT AFFECT ANYTHING, AN EASY FIX IF IT BOTHERS YOU. THESE THINGS ARE NOTHING BAD BUT JUST AGE RELATED, JUST WANT TO TRY AND GIVE AN HONEST DESCRIPTION!! PLEASE! PLEASE! NO TIMEWASTERS! SORRY TO HAVE TO SAY THIS BUT WE GET THEM ON HERE. HAVE NOW HEARD ALL THE STORIES AND EXCUSES!! WE DONT HAVE TIME FOR WASTERS AND THEY ARE UNFAIR TO US AND OTHER EBAYERS. ANYONE WHO BUYS IT NOW AND FAILS TO PAY AND COLLECT WILL GET AN UNPAID STRIKE ON THERE ACCOUNT. SORRY IF THIS SOUNDS HARSH BUT WE HAVE BEEN BITTEN TOO MANY TIMES ON HERE. 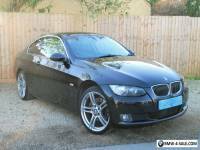 IF YOU ARE UNSURE PLEASE VIEW THE CAR FIRSTIF YOU BUY IT NOW YOU HAVE BOUGHT THE CAR. SIMPLE!! BARGAIN! 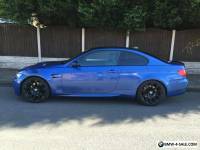 BMW 520d M SPORT LCI BUSINESS EDITION! FSH! LOW MILEAGE! 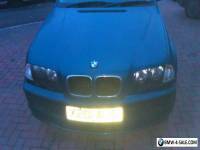 BMW 5 Series E 60 520i 2004.